You can target 1 face-up card you control; you cannot Special Summon monsters from the Extra Deck for the rest of this turn, except Machine-Type Synchro Monsters, also, destroy that card, and if you do, Special Summon 1 "Crystron" Tuner from your Deck. 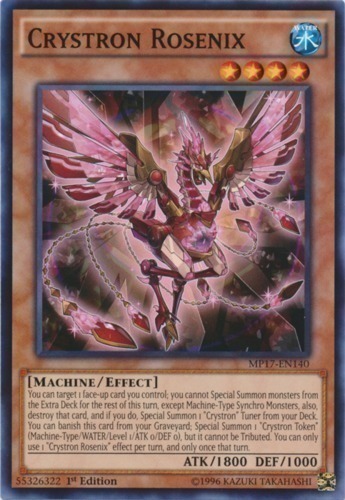 You can banish this card from your Graveyard; Special Summon 1 "Crystron Token" (Machine-Type/WATER/Level 1/ATK 0/DEF 0), but it cannot be Tributed. You can only use 1 "Crystron Rosenix" effect per turn, and only once that turn.